What’s your plan to migrate legacy databases to a modern platform? This project is critical to your business, and doing it without help is risky, to say the least. A third-party migration expert might be your best bet to guide you past the typical stumbling blocks. 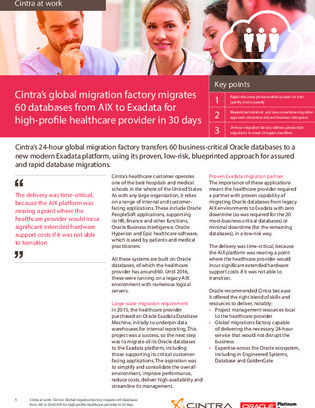 Download this case study to explore how Cintra helped a high-profile healthcare organization transfer 60 business-critical Oracle databases to a new modern Exadata platform with their 24-hour global migration factory.